Are you attending a conference, meeting or any occasion where a printed poster is required? We print your scientific/infochart/artwork poster and deliver to any location within Vienna in time! We are an on-demand printing company based in Vienna and offer high quality solutions. Personalized services at a competitive pricing – guaranteed! FREE DELIVERY to any location in Vienna! Our EXPRESS service ensures that you get your poster within the next 1-3 hours! Just send us the file to info@xest.at – We always answer fast - Monday to Sunday, also on holidays! Urgent order? No problem! Give us an additional call at +43-1-3327588 to ensure that your order will be handled with the highest priority! 24h service support | we accept credit cards! Our ECONOMY posters for 66€ do not come with free delivery in order to offer it for the lowest possible rate. Many customers who only use the poster for a very short period requested this. XEST Nimmerrichter does not offer any storefront. Thanks to this we can offer services 24/7 but our office is not always staffed. Nevertheless, we can offer a pickup possibility in central Vienna for your orders at our PICKUPStation. This is a digital locker system where we keep your orders ready for pickup. When ordering the ECONOMY PICKUP Poster we will inform you about all the steps how to receive the poster. 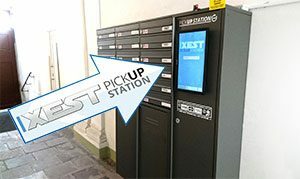 Our PICKUPStation is available 24/7 and you can directly pay with credit card at it.